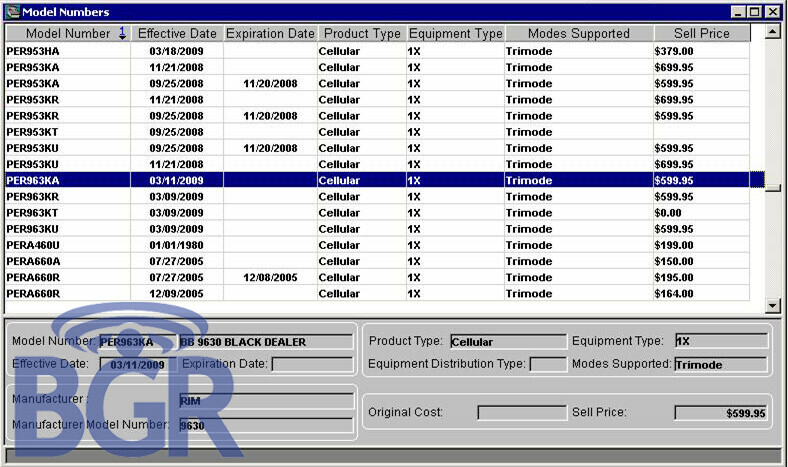 Bell's inventory report shows the BlackBerry Tour 9630? BGR got its hand on what seems to be an inventory sheet for Bell. What model appears on the paper? No other than the BlackBerry Tour 9630 priced at $599.95 Canadian Dollars if you go contract free ($510 U.S. bucks). While no subsidized pricing figures were on the document, BGR says that based on the past pricing history of the carrier, they would expect the device to cost $199.95 Canadian Dollars with a 3 year contract. No specific launch date for Bell was spotted. What about all BlackBerry fans in the U.S.? We reported at the end of last month that expected the 9630 to pop up at Verizon stores in July. That date might be a bit too pessimistic and we would expect to see more leaked documents and some more recent spy shots of the handset as we move into the home-town stretch to its release in the U.S. and Canada. Cannot wait to get this piece on VZW! !